Bring pet dander relief to your family with an air purifier from Rocky Mountain Air®. Utilizing a seven (7) stage filtration process, the Summit air purifier removes pet dander and pet odors from the air you breathe at the push of a button. No longer do you need to let allergies get between you and your beloved pet. Your entire house can be free of dander and pet odors as the Summit provides fresh and clean air to 3,500 square feet of your home. In addition, our best-in-class air cleaning technology features HEPA certified filtration, ion generation, and germ killing UV sterilization. By providing layer upon layer of protection with our multi-stage filtration, each air purification system eliminates 99.99% of airborne particulates. Whether you suffer from a dog allergy, cat allergy, or bird allergy, you will be absolutely thrilled with the results! Simply set your air cleaner to run while you're away, and come home to Pure Rocky Mountain Air®. 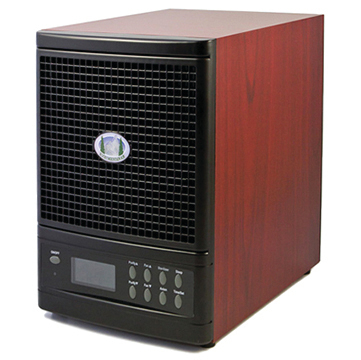 The Summit is a powerful air purifier that removes pet dander and odors from the air you breathe. Whether or not you need to eliminate dog dander, cat dander, or bird dander, the Summit will make the air in your home as fresh and clean as the Rocky Mountains! Seven Stages Of Purification: Photo-Catalytic FilterAn emerging technology in the HVAC (heating, ventilation, and air conditioning) industry , Photo-Catalytic Oxidation (PCO) filtration allows organic compounds to bond with filter components to trap airborne contaminants. Once pollutants are contained, an oxidation process takes place, which breaks down each particle into harmless molecules like water and carbon dioxide. PCO filtration has proven most effective at eliminating odors from pets and household cleaning products and is an important feature in each of our air purifiers.